Growing Up Geeky: Our first nursery items arrived! Our first nursery items arrived! I have to wait until M gets home to start putting everything together, but here are our big purchases! We haven't bought any of it yet, but here is the bedding we've chosen. I love it! I really love the dark woods in a nursery and that glider looks so comfy. Hey! I'm new to your blog and just about a week ahead of you! I looove all of your furniture- the changing table is great! I haven't seen anything like it before. I love it all! That changing table is fabulous! love it!! 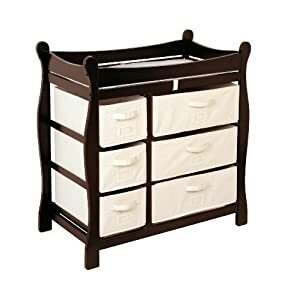 I love that changing table the most, and the bedding is soo cute! It's so exciting to get started on the nursery! So adorable for baby "G", which will have a name by next Monday night! Super cute!! I love the bedding too! Very sweet! Love it! I think it all matches perfectly, and I like how the changing table has all those organizer drawers, thats awesome! How long until the cats think the furniture is for them? How cute! I love it!!! I love the bedding, it's so friggin cute!!! looks great! is that bedding cocalo brand? that is what ours is and we love it - the quality is nice!